Hike taken on June 27, 1999 by Don and Marina. I am not good enough yet in html for you to fire on this link and have it come up with a save file window, but if you right click (in Netscape) on the link, you can use the save link option to save the file. Now a running description of the hike. Marina, Don, Athena, and Minerva left the trail-head at a very late 9:25 am. We got a late start. The parking lot was mostly full. We also traveled fairly slowly. We passed no one and a number of groups passed us. This tells you that if you are in shape and really move, you will be done in much less time than 8 hours. The first part of the hike is a small trail on an easement granted to the Forest Service, a short (couple of hundred of yards) on a private road, then a steep climb through sage brush on a rocky trail. On this date, the wild flowers were all out giving a wonderful color show, and the view back across Lake Dillon is quite impressive. As you hike up this first hill, Interstate 70 can be seen on your right climbing towards Eisenhower Tunnel. By the time you reach the summit of Ptarmigan, you will be higher than the tunnel. After cresting the first hill, you will come upon a large sign indicating you are leaving private property and entering the National Forest. The sign itself is just a large piece of plywood upon which various signs have been posted at one time or another. This is the second way point "NF Sign" or "PT NFS". A slight downhill now ensues. You pass through an Aspen grove until you come to power-lines. At this point, according to the topo's you can turn right and take the alternate old jeep road up to the wilderness boundary. We have not taken this trail yet, so can not report on it. Anyway, the main trail goes straight through the power lines and starts a gentle climb. During this portion of the hike, the trail climbs gently through Aspen and Pine groves, with an occasional Sage meadow. During this portion, you are now on the west facing slope of the mountain. Views of the Gore and Ruby Ranch will be seen on your left. The trail then comes to the first of two creeks. Water your dogs here. The trail comes out of the first creek, increasing the pitch of the climb slightly. You are still going through Aspen and Pine groves on your way to the second creek. This is most likely your last water on the hike. Knowing this, we brought extra water for our dogs. We have hiked this mountain twice, once in late June and once in late July. Both times these were the only creeks we crossed. Up at timber-line there is a small wet-lands which had some water for the dogs. After leaving the 2nd creek, the rate of ascent increases again. A short hike brings you to an outstanding overlook of the Gore Range. Others before me have thought so as well, because you will find some benches made from old logs. This is a good place for a Gorp and water break. I have this place way pointed as "Bench" or "PT BEN" Both of the creeks are way pointed as well. Leaving the bench you continue the climb, with the forest turning more towards Pine and less of Aspen. The next way point is a sharp turn up the mountain. Up to this point the trail has roughly paralleled Colorado 9 and the Blue River. Serious climbing (for this mountain) starts here. I have put a way point in at this location as "Turn Up" or "PT TRN". I show this on the map as "bend". If you were to camp overnight (and brought your food and water in), there are a number of good campsites to the downhill side of the trail. The trail goes through a number of switch-backs during this elevation gain (I think I counted 11 in all) as you climb through the forest. You will be going in and out of an area which is mostly meadow with Pine. 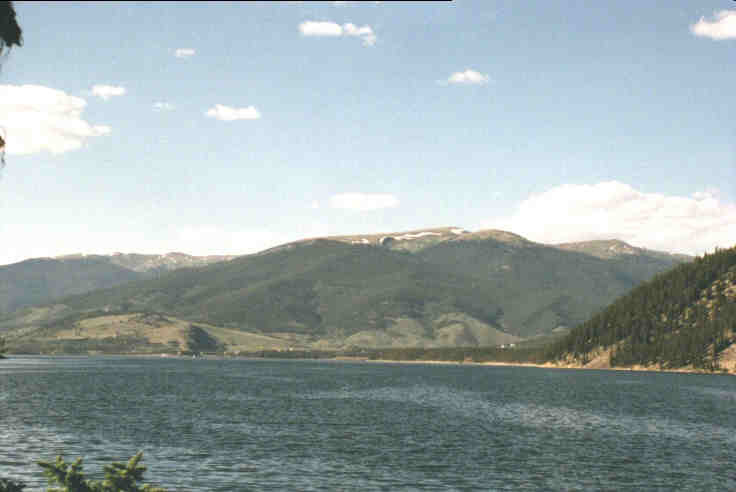 When you are in this meadow, the Gore Range is visible. Finally after all of the switch-backs are done, you will come to a sign indicating you are entering the Ptarmigan Wilderness area. It is at this point that the alternate route rejoins the trail. The trail itself turns back to running parallel to the Blue, and you ascend to above timber-line. It is at this point that the last water was found for the dogs. A short climb brings you to the first of the false summits. It is marked as "cairn" on the way points and can't be missed. On both of our hikes we had our lunch here, both to rest and lighten the packs. In late June, there were many wildflowers, including small blue Forget Me Nots and yellow wildflowers, and a great view looking back to the Gore Range. I believe that this is also a USGS benchmark at 11,630 feet. This can be seen on the larger map easier than the smaller. On our first hike, this is where we gave up. We had only been in Summit county for a short time and were not fully acclimated. This hike, we were more successful. From here to the top is just meadow. With lighter packs and the rest, our rate of speed was much better than right before lunch. We reached into our packs and pulled out fleeces to keep warm. The hike through the trees to this point was definitely done in shorts, but now we were above tree line, with a constant wind, and warmer clothes were called for. The baseball hats went into the packs as they would not stay on. The trail after leaving the cairn becomes poorly defined. I guess a lot of people only make it this far. However the last hour of hiking is worth it. The views just become better and better as you start to increase your visibility in all directions. The slope is gentle, and you can tell where the trail is by the matting down of the grass. The trail snakes around the Northwest side of the summit. As you turn more easterly, the Ptarmigan Ridge trail is plainly visible (and better defined than the trail you are on) below and to your left. You will see a cairn with a tall log or pole appear on your right indicating the summit. This is actually the second of these cairns you will see, but it is obvious that the first is not at the summit, so keep to the trail. The summit is at approximately 12,500 feet, and you started at approximately 9100 feet. From here you can see all the way around. The view looking more or less North and SouthEast. Also seen on this part of the trail is an old skeleton of some plant eater (cow maybe) on your right (going up). After the summit, it is all downhill....We stowed our fleeces back at the Wilderness sign and continued down, making better time than on the way up. When we reached the power lines, we were pretty beat, and that slight uphill was not welcome. Worse yet was that final downhill on the rocky part of the trail. When you finally finish this, a dinner out is in order as you will be too stiff to cook for yourself.